Ahoy thar maties! Today be national “talk like a pirate” day. What better way to celebrate than dressing up like a pirate, reading some stories with classes around the country, writing some fun pirate sentences to practice saying, and creating some pirate stories. That’s exactly what we did in the Barrow library. The planning started last weekend, when I started looking for classes in the school who wanted to participate. As class signed up, I used twitter to locate some special library friends around the country to connect with. take turns reading pages of a pirate story so that voices in each location were heard. Sometimes it would be the librarian and other times it would be the students reading. At tables, write pirate sentences using a pirate vocabulary sheet. Students could stretch out an -ar word or they could use actual pirate vocab. Students moved to do projection areas to have an adult type their sentence onto a padlet. 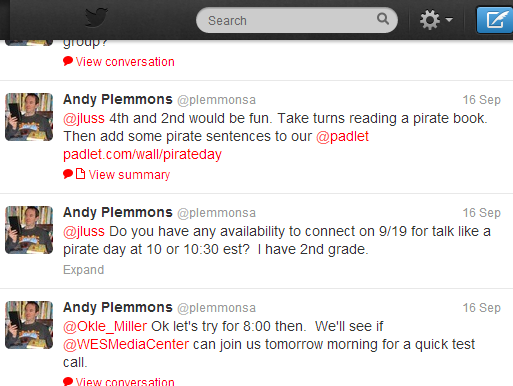 Throughout the day, any school could add to the padlet as they had time. We started our day with Mrs. Boyle’s Kindergarten class. They have been learning how to tell stories from pictures. 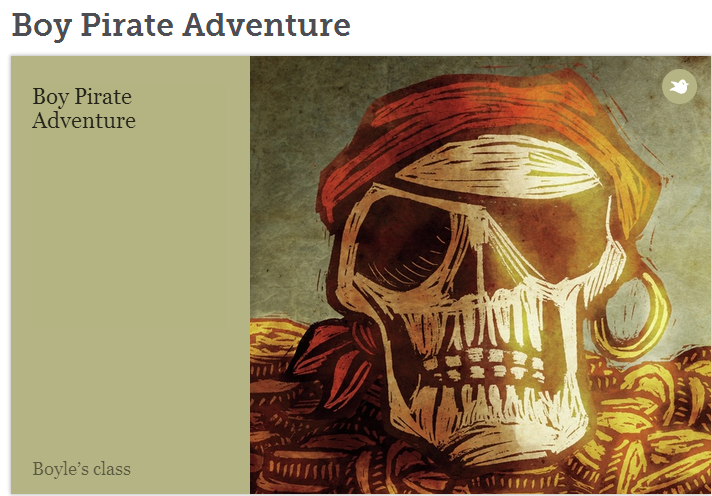 Today was the launch of our storybird project, so I decided to focus our storybird on pirates. After warming up with some “Tell Me a Story” cards, we searched for pirate pictures on Storybird. We made a simple story with a beginning, middle, and end. It was a challenge to link our story together between pictures, but the students did a great job working together. Be sure to read their story here. Next, we skyped with Shannon Thompson at Stroud Elementary in Athens. Shannon and I took turn reading A Pirate’s Guide to First Grade by James Preller. We both read in our best pirate voices. 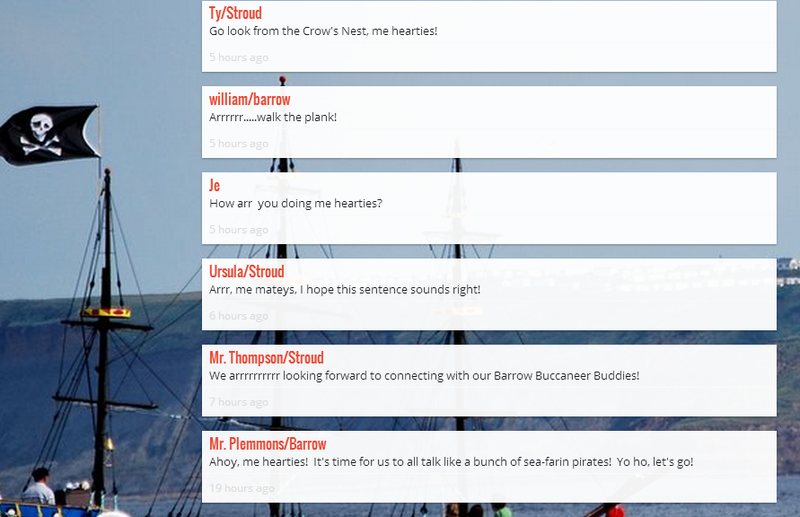 Following our skype, we disconnected and students added sentences to the padlet. We reconnected on skype and students shared their sentences with one another in their best pirate voices. We had a few sound issues, which led me to switch the webcam I was using. 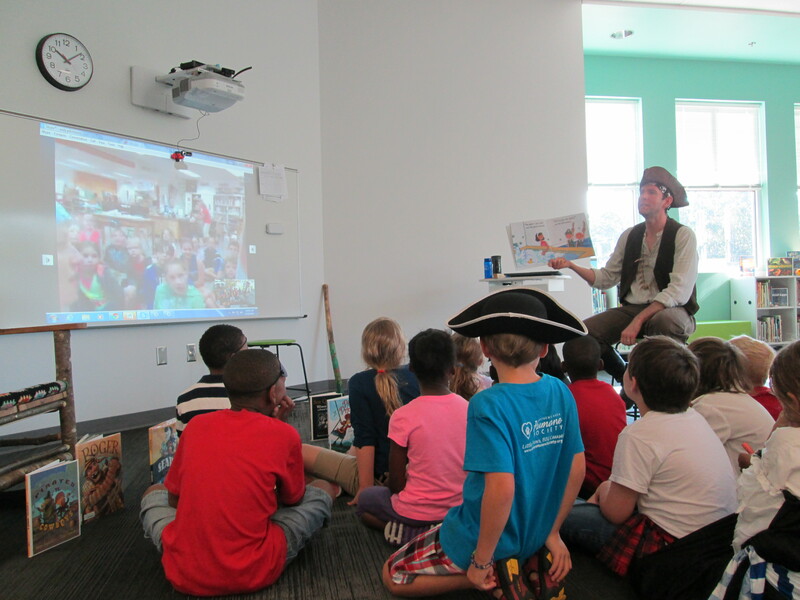 At 10 & 10:30, Mrs. Wright and Mrs. Ramseyer’s 2nd grade classes connected with Jenny Lussier’s 4th graders in CT. During one session, we read Bubble Bath Pirates by Jarrett Krosoczka and during the other session we read How I Became a Pirate by Melinda Long. It was fun to hear our different pirate voices and share the many costumes that both of our groups of students were wearing. 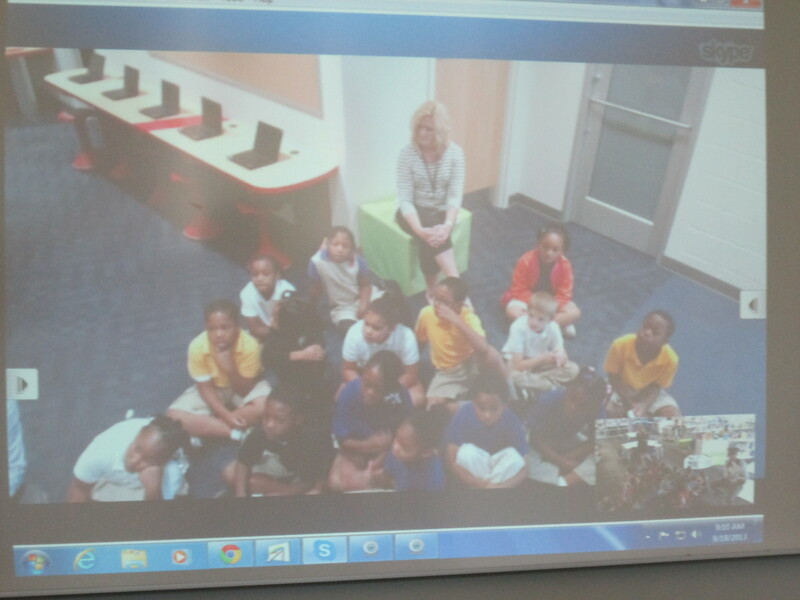 At 11:45, Mrs. Yawn’s 2nd grade class had a special triple skype. We connected with Okle Miller in FL and Edie Crook in NC at the same time. 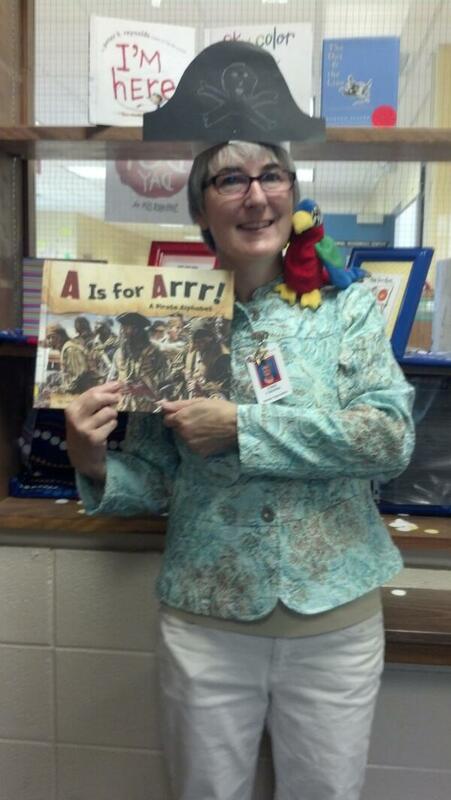 Okle and I read How I Became a Pirate by Melinda Long and Edie Crook read A is for Arrr! by Laura Salas. Okle had on a great pirate costume, and Edie’s students had made great pirate hats to share, too. It was fun to know our voices were connecting from 3 different southeastern states. At 1:15, Shannon Miller’s students connected with Mrs. Em’s 1st grade students. We read How I Became a Pirate by Melinda Long. Our students also took time to share what was going on at our schools today. In addition to pirate day, our students had a walking field trip and Shannon’s students had dot day, Homecoming, and a color challenge. Shannon’s students took time to add to the padlet after our connection, while Mrs. Em’s students added sentences that focused on words that used sounds they were working on in class. 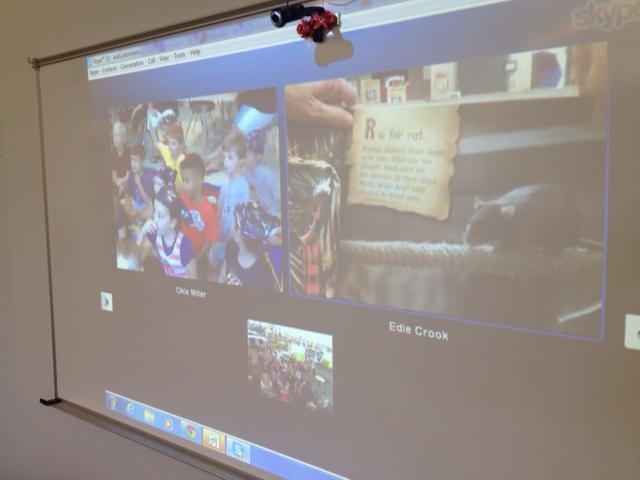 Finally, at 1:45 Mrs. Choate’s Kindergarten class connected with Edie Crook in NC. 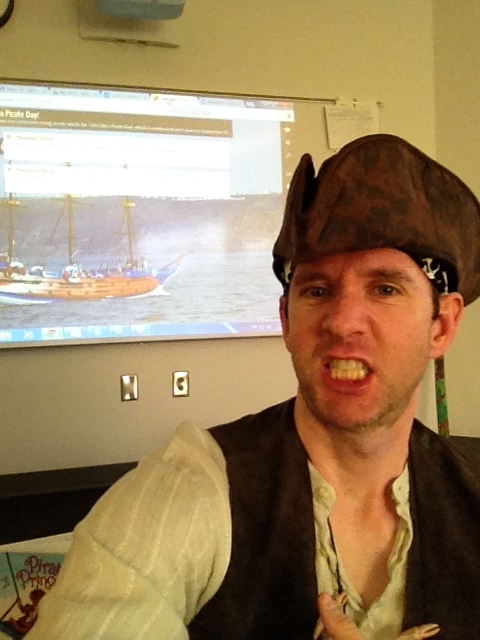 I read Bubble Bath Pirates by Jarrett Krosoczka and Pirates vs. Cowboys by Aaron Reynolds. It was a challenge to switch from pirate to cowboy while reading the book. It would be a fun book to read over skype if both schools have a copy because you would only have to keep up with one accent. I loved hearing Edie’s students make connections between the two books. It was a fun-filled day. We made connections. We read text and had great discussions. We practiced reading fluently and with expression. We practiced our sentence writing. I’m exhausted. Now off to Krispy Kreme for some free donuts. They are giving away a full dozen of donuts if you are dressed like a pirate! This entry was posted in Connected Learning, Events, technology and tagged connected learning, connected libraries, read aloud, sentence writing, skype, talk like a pirate day, writing.